Vida Mia dance shoes are designed and tested by tango addicts, who don�t like foot pain limiting their dancing. Have you tried many different brands of tango shoes, including custom made shoes, and still suffer pain on the dance floor? After intensive research Vida Mia was developed using a special scientifically designed impact reducing technology! Each pair of Vida Mia�s has this built-in super cushioning, yet provides a solid connection with the floor. And this special padding does not collapse after a few times, but continues with the same great cushioning qualities even after hundreds of wears, so you will continue to feel like you are dancing on a cloud. Do not confuse this cushioning with 'extra padding' offered by other manufacturers, it is completely different. These shoes have been extensively tested by many different dancers with happy feet after long hours of dancing. 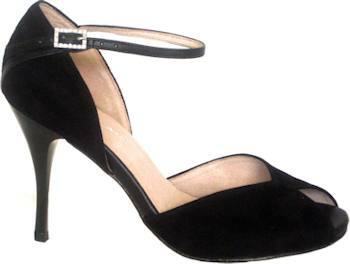 The shoes are made with beautiful black suede and a black heel. The inner lining of the shoe is made from super-soft goatskin. Every small detail is considered in the design, right down to the beautiful crystal buckles. These shoes have 3 1/4 inch (8cm) heels, and come with either suede or leather soles, and with a choice of buckle around the ankle.